One of the best ways to experience a new restaurant is with friends, especially ones who are already regulars there. Knowing you can lean on their expertise helps ease the angst of trying something new. 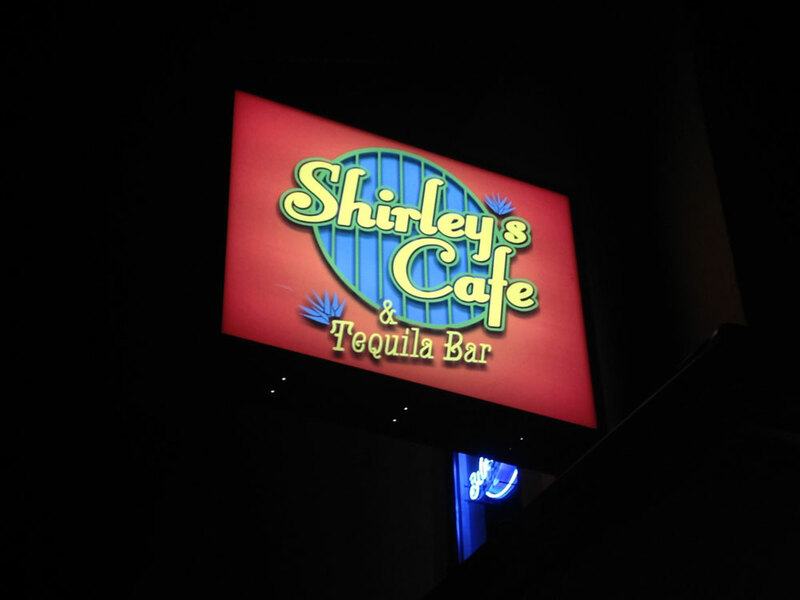 So when some friends asked us to join them for dinner at Shirley’s Cafe & Tequila Bar, we couldn’t turn it down. Shirley’s is a little off the beaten path, set in the middle of what was once a thriving industrial district in Laureldale. An abandoned factory sits rotting across Duke Street. Our friends have claimed the vacant driveway as their personal “VIP” parking space. The building that houses Shirley’s blends in with the neighborhood. Utilitarian in appearance, only the glowing sign above gives away that it’s a restaurant. Inside the front door is the crowded bar area. Hang a left, and you’ll find the patio (and after a few seconds, you might also find the button that opens the sliding glass door). That’s where our group of six relaxed for a pleasant evening. 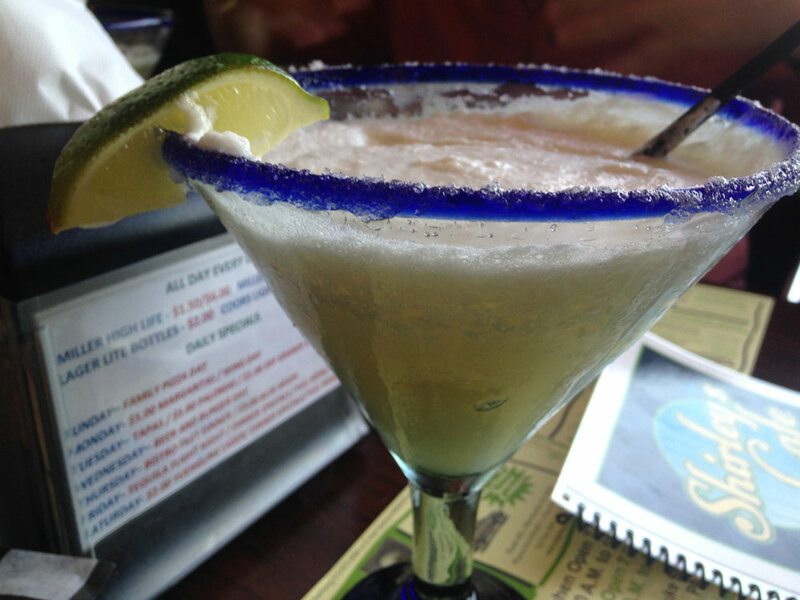 Being that Shirley’s is a tequila bar (and being that I don’t drink), Julie had to try one of their margaritas. The Coco Cobana was one of eight fruity margaritas and featured a lot of coconut, a little mango, and just enough tequila. 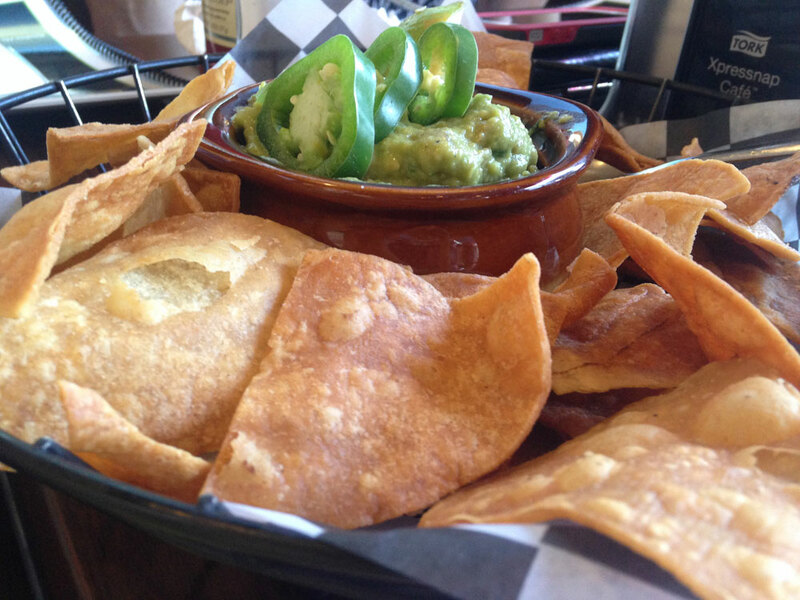 We were dining a little later than usual, so we were excited when our chips and guacamole arrived at the table. The chips were advertised as fresh “made locally,” and it showed. The corn chips were fried and much thicker than the store-bought variety. The guacamole was also fresh, topped with a wedge of lime and slices of jalapeno peppers. Once I ate the first chip, I couldn’t stop. The chips could not have been any better, and the guacamole was excellent, with diced red onions and the occasional chunk of tomato. I wasn’t expecting a tequila bar to have such variety on its menu. Of course there were tacos and quesadillas, but the Latin American influence was strong throughout the rest of the menu. Along with seven traditional pizza varieties, there were three pizzadillas: pizzas done quesadilla style. But my eye stopped at something I had never come across before: cazuelas. 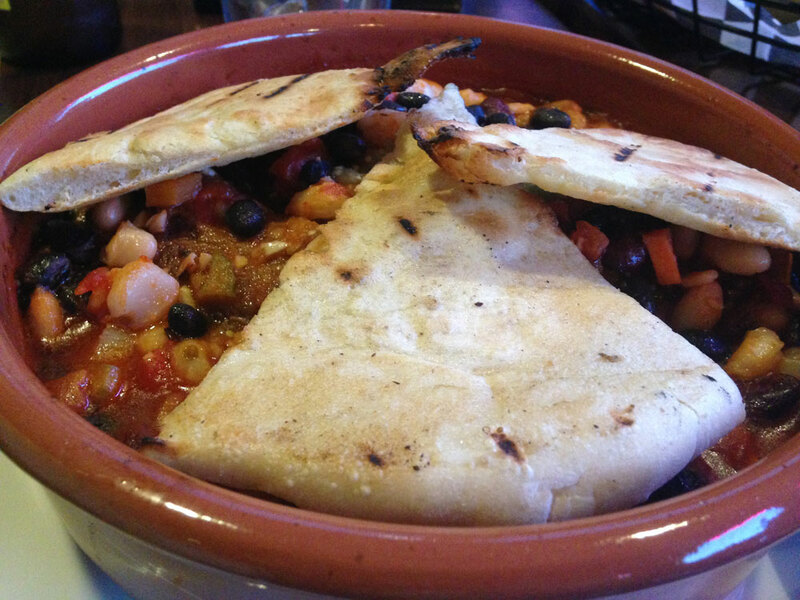 The word cazuela comes from the Spanish for “cooking pot,” and refers to a variety of South American dishes. Shirley’s offers three varieties including the “Shrimp Vera Cruz” (shrimp, tomatoes, assorted vegetables and rice) and the “El Cioppino” (an ocean of seafood like clams, mussels, and calamari mixed with sausage, vegetables and rice). Add to that my choice of meat—carnita style pork shank—and three pieces of flatbread and it was one hearty meal. And Shirley’s doesn’t skimp on the portions either. It was served in a seemingly bottomless terra cotta bowl. The dish looked like chili, but lacked the heat of the chili powder. That’s not to say it was without spice, as it got a little bit of a kick from the chipotle seasoning. Digging beneath the surface, I found my three pork shanks. 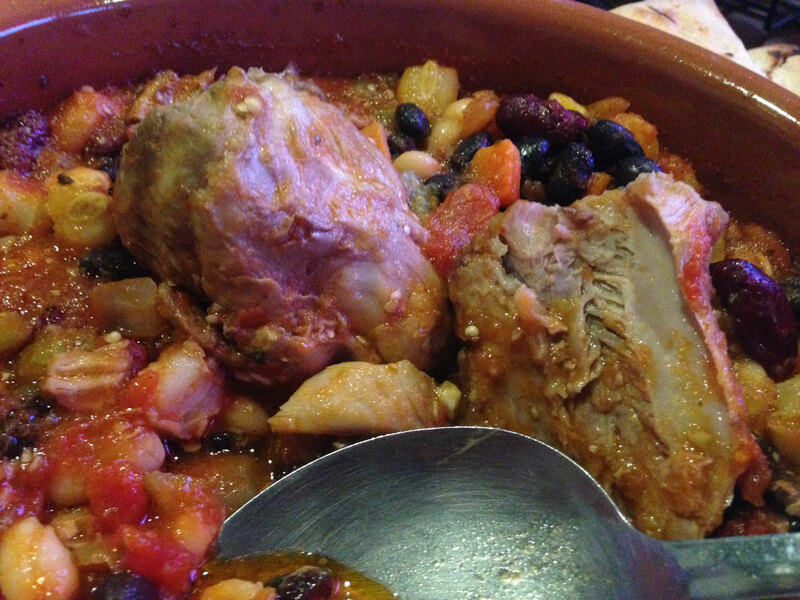 The meat pulled right off the bone and blended nicely with the beans and vegetables. Half of the stew and one of the pork shanks came home with me, but I enjoyed every bite I had at Shirley’s. Julie went with something a little lighter, but no less flavorful. 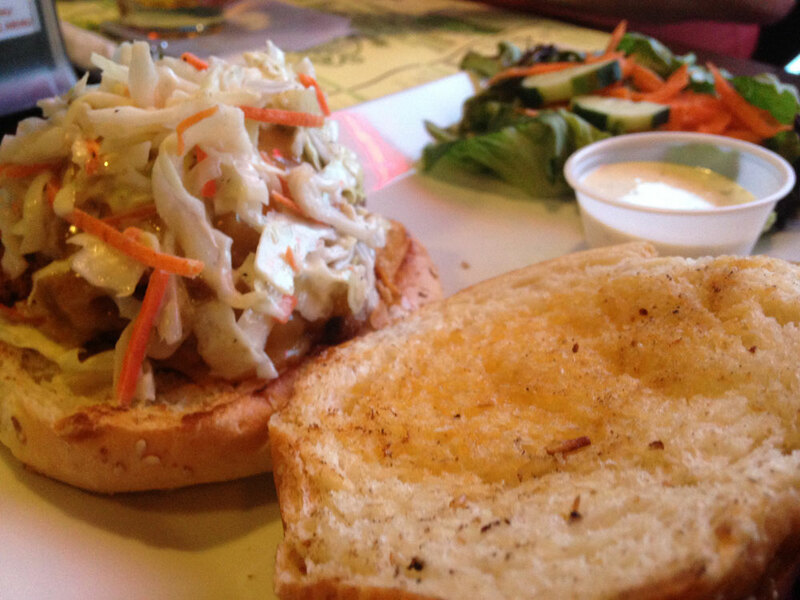 The Texas pulled pork sandwich was topped with Colby Jack cheese and sweet and sour slaw. The top of the roll was lightly buttered like a slice of garlic bread or Texas toast. The pork was lightly sauced, which helped the other elements truly blend well to create a delicious sandwich. All of the sandwiches are served with a choice of beer battered fries or a salad. Julie opted for the healthier, lighter option with a cup of ranch. When the meal was over and the checks were split, our total came to $30 (that did not include the $7 chips and guacamole). It was worth every penny. A great night out with friends is always worth the cost. But when that night out includes an introduction to a new restaurant, it makes it all the better.